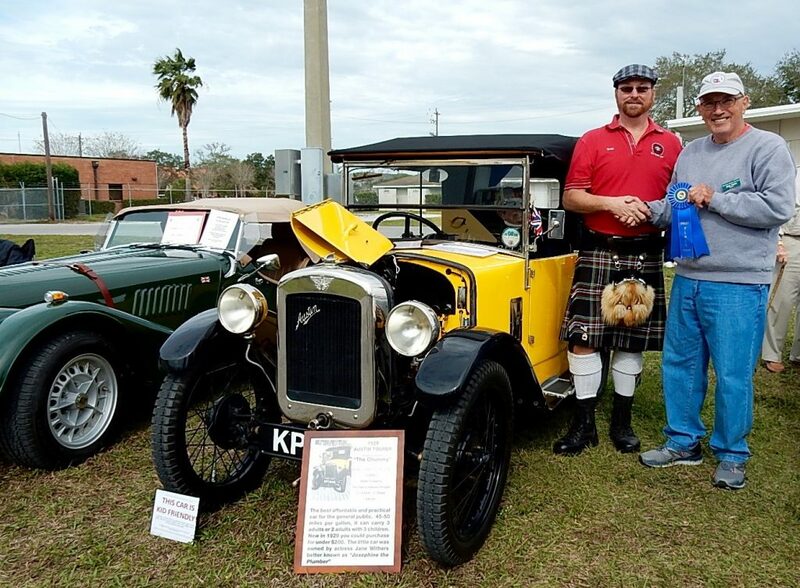 Bob Faria collected a Highland Games’ First Place ribbon for his 1929 Austin Tourer “Chummy.” Ninety years old! The 25th annual Sarasota Highland Games & Celtic Festival was held on Saturday, January 26, at the Sarasota County Fairgrounds. The day started out chilly with a brisk wind and remained partly cloudy the rest of the day. As in previous years there was much to see and do but the weather forecast for rain showers throughout the weekend likely put a dent in the overall attendance. That might also have held down the number of vendors that usually participate. As it happened, there was only a brief sprinkle in the early afternoon. Those who ventured out had an enjoyable day! The club participation included 16 cars representing a wide variety of marques.